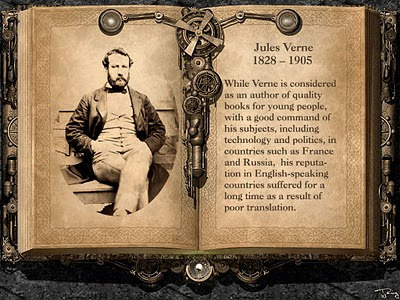 While September is devoted entirely to Jules Verne and steampunk, the sheer volume of the man's work precludes looking at his writing beyond the most popularly known novels. My research over the past two years has demonstrated repeatedly that 20,000 Leagues Under the Sea is the work most steampunks reference when speaking about Verne as proto-steampunk. I'm in agreement with Greg Bear, who speculated that the steampunk aesthetic really began with Harper Goff's design of the Nautilus in the 1954 Disney version of 20,000 Leagues Under the Sea (Eaton SF conference 2009). 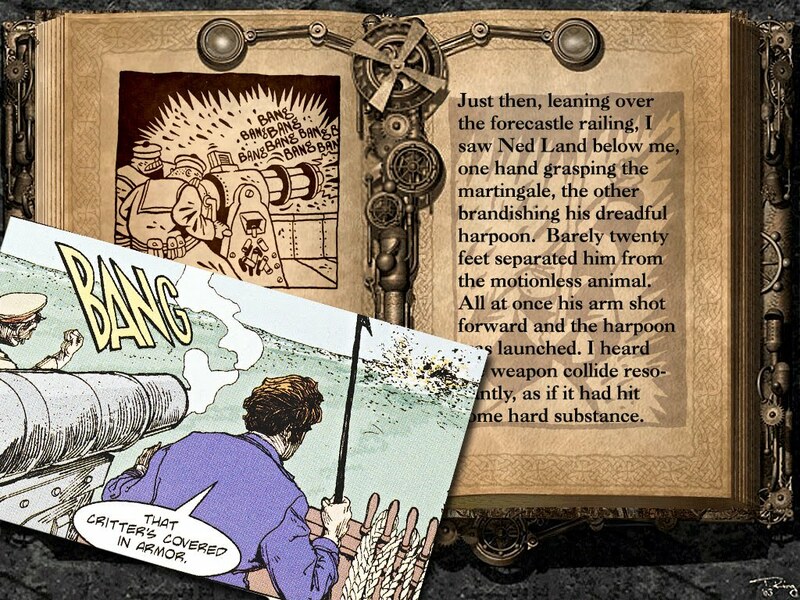 As I'll discuss further in the Verne at the movies post, I'm dubious about how much direct influence one can draw between Verne's actual texts and steampunk. Instead, I'm of the opinion that the glut of cinematic adaptations and knock-offs are the source of many steampunk fans' perceptions of Verne's works, in much the same way we currently see people's perceptions of Tolkien's Lord of the Rings novel coloured by Peter Jackson's film versions. 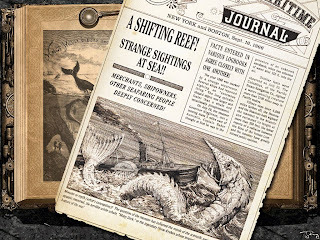 Additionally, the steampunk works I'm looking at in relation to Verne (The Dark Deeps, The League of Extraordinary Gentlemen, The Secret Sea) draw from 20,000 Leagues Under the Sea (20KL), with the exception of the wonderfully whimsical "Selene Gardening Society," which plays off From the Earth to the Moon and its sequel, Around the Moon. 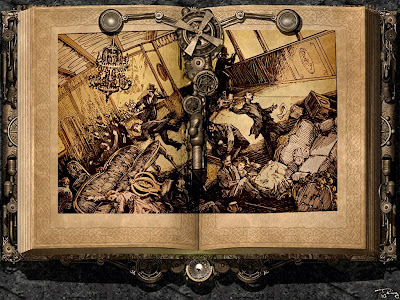 There are steampunk works which reference Around the World in 80 Days and Journey to the Center of the Earth, but 20KL remains a steampunk favorite. 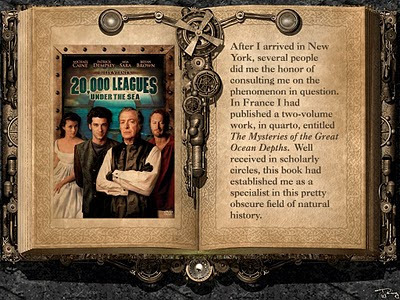 Accordingly, to start off our month with Jules Verne, I present a brief synopsis and analysis of 20KL, along with the slides I use when teaching it, to give readers who have either never read 20KL a better idea of its actual plot (so often butchered in the film adapations), or to converse with readers familiar with the material about the novel's thematic elements: spoilers abound. While I had originally intended to talk about the original book, the films, and some graphic adaptations separately, I found once I got into my writing that it was easier to talk about all of them in tandem. Before getting into the novel, I think it's essential to inform new readers about why they're going to meet with odd looks from literary aficionados in North America. One of my students remarked that her father had dismissively told her Verne wasn't literature, which concerned her, and allowed me to explain that misconception. Verne was French, which also surprises English readers from time-to-time, and accordingly his works were translated for consumption in other countries. Verne is one of the most-translated authors of the nineteenth century. However, quantity didn't guarantee quality, and many of his books were very poortly translated. 20KL is an especially interesting study of the vagaries of translation, since it wasn't simply bad translation, but censorship that sullied Verne's reputation. One of the best articles on the subject of the problems of translation is Arthur B. Evans's "Jules Verne's English Translations," while his "Bibliography of Jules Verne's English Translations" will help you separate the good from the bad. My favorite version of the text is Naval Institute Press's Completely Restored and Annotated Edition, translated by Walter James Miller and Frederick Paul Walter. It's a lovely book filled with great footnotes that enlarge one's experience of reading 20KL. It can be found online as well, sans footnotes. Many are familiar with the novel's opening, which is brilliant, considering the original cover. Most modern 20KL covers unfortunately give the game away immediately, a move made under the erroneous impression that everyone knows the identity of the monster of the opening chapters. As time goes by without a decent cinematic version of 20KL, an entire generation is growing up with knowledge of the title, but little idea what the book is actually about. When I taught 20KL for the first time last fall, I was surprised at how many of my students didn't know the book was about a submarine: a few were even disappointed at Verne's reveal of the monster as a man-made underwater vehicle, which gave me a fresh insight into the original cover. You have to work hard to find the men in diving suits. The rest just leads the reader down the path of misdirection Verne engages in for the first seven chapters. I've used a number of sources for my slides, and the above faux newspaper frontpage is from Gary Gianni's brilliant graphic adaptation of 20KL. If you're looking for a faithful and largely comprehensive graphic adaptation of the text, Gianni's version cannot be beat. 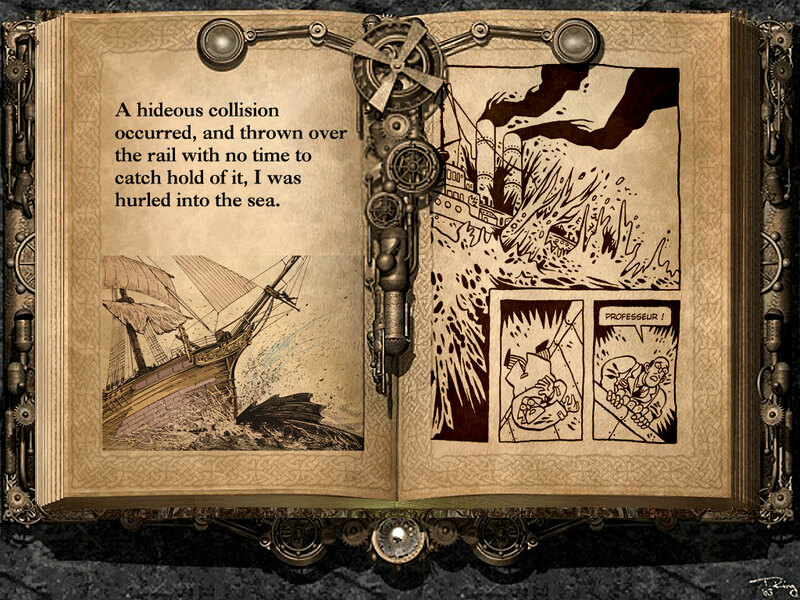 Here, he visually captures the mystery of Verne's opening chapters. 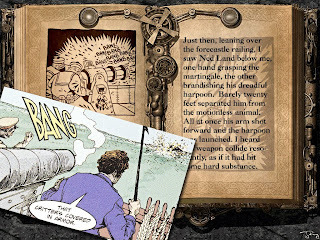 The opening of 20KL is the first of many progressive slow-reveals Verne engages in: first, in identifying the "monster," and then in revealing the inside of the Nautilus, then finally, in revealing Nemo's mission and to some degree, his character. Of course, this is more than artistic skill: 20KL was originally published periodically, in magazine installments. Accordingly, many of the chapters end with a cliff-hanger, or a question to be answered. Where Verne shines above other serial-writers is that he strings out larger mysteries over the episodes, in the fashion popular television shows string their viewers along. I actually think 20KL would make a great season of television (sadly, it's mostly inspired abysmal made-for-TV movies). 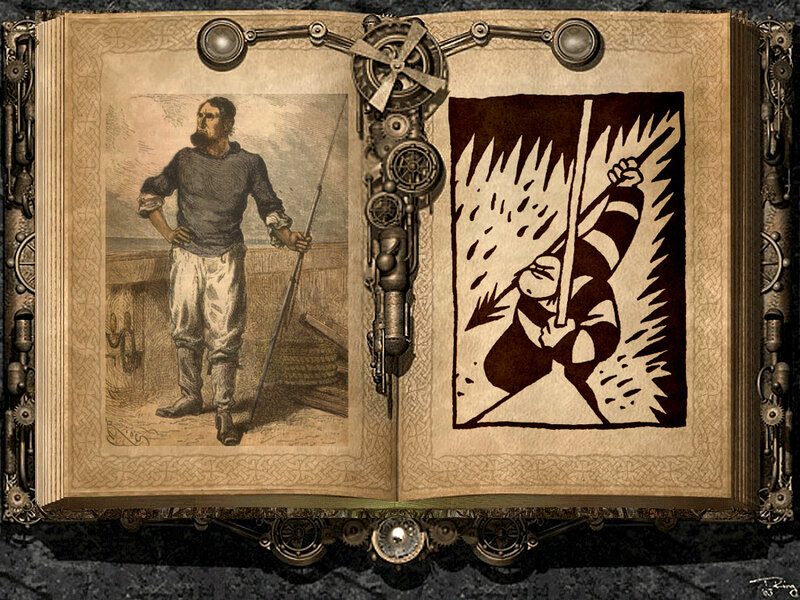 More of Gianni's art - a two-page splash of the Scotia being struck by "the monster." 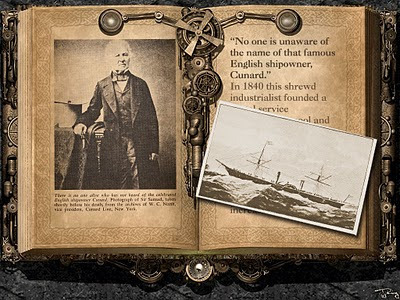 This is a key moment in the opening chapter for many reasons, not least of which is that Verne references a real ship: and not just any ship, but a vessel of the Cunard line. As Verne puts it, "There is no one alive who has not heard of the celebrated English ship-owner Cunard" (7). Verne is already dropping clues to later mysteries, by revealing that "the Scotia had not struck, she had been struck, and seemingly by something not blunt but sharp and penetrating" (9). This initially seems like intent, but Nemo will later reveal this was an accident, a moment I playfully find rather dubious. 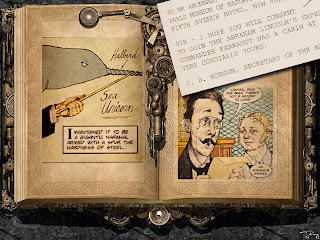 My own recursive fantasy of this is that Nemo was seeking to cripple trans-Atlantic mail communication, but I say that tongue-in-cheek, in the same way I think Neil Gaiman intends when he says he can prove Dr. Seward is Dracula using Stoker's words! Yet there's more to the attack on the Scotia than its British origins. Miller and Walter note that the Scotia held the record for running from "New York to Liverpool in 8 days, 22 hours" (7). demonstrating the speed of the Nautilus as matching or exceeding the speed of the fastest steamship of the day. I think its also noteworthy to remember that Verne was fond of referencing real-world figures and vessels, which makes him more analogous to techno-thriller writers like Michael Crichton than SF or steampunk writers. The point at which the novel's narrator, Professor Aronnax, reveals himself to the reader is what caused Walter Miller to first think about an updated translation, since the poor translations erroneously state that Aronnax was "in the disagreeable lands of Nebraska," as though the good professor hated the Great Plains. What it should actually say is that he was in "the Nebraska badlands" (11). It's moments like these that have lead North American scholars to dismiss Verne as boys' adventure writing. Further, in chapter three we are introduced to Aronnax's manservant Conseil, whose only fault was utter formality, so that he "never spoke to me except in the third person, and to the point of aggravation" (18). This results in Conseil making statements like "Has master called for me?" rather than "Did you call?" However, poor translations used the pronouns in place of "master" or "monsieur," leading detractors to state that Verne couldn't write consistent characterizations. 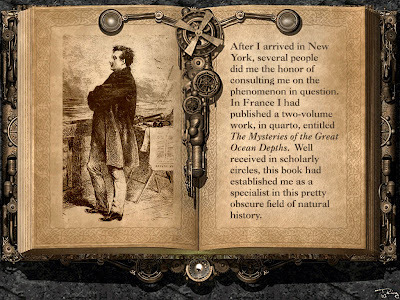 Aronnax is a brilliant man of science, the author of The Mysteries of the Great Ocean Depths, and unlike his portrayal in Disney's film version and later by Richard Crenna, is only forty years old. 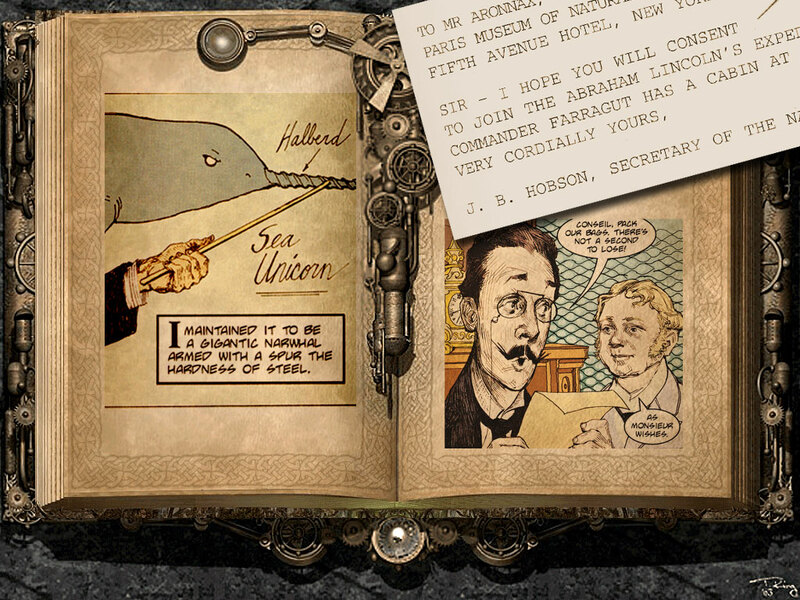 The above illustration of him was modeled on Verne. The atrocious made-for-TV version featuring Patrick "McDreamy" Dempsey portrays him both as younger and far less competent, being forced to argue his theories about the sea monster rather than respected enough to warrant an invitation, in a typical pop-film idea of what passes for a character arc, or drama. I'm often chagrined at filmmakers (and a scholar or two) who state that Verne couldn't write compelling characters. The relationship between the four men of 20KL has much room for complexity without adding pop-psych elements, like the Dempsey-Aronnax's issues with his father, which create an excuse for his admiration for Nemo. Once Aronnax and Conseil set out aboard the steamship Abraham Lincoln in search of the "monster", they are introduced to master harpooner and Canadian, Ned Land. I was amused as an adult to read Ned's heritage, since modern perceptions of Canadians are far from the robust, frontiersmen-like aspect Ned strikes. The casting of Ned Land in film versions of 20KL is an interesting commentary on the character and the development of the Canadian stereotype. In the middle of the nineteenth century, Canada was still a vast, untamed frontier - so to have a "manly-man" like Ned Land hail from the Great White North made sense. Kirk Douglas's performance as Ned in the Disney version is more happy-go-lucky than the Ned of Verne's 2KL, but he is a far cry from Canadian Peter Gross's pretty-boy in 1997, the same year Australian Bryan Brown played Ned in the McDreamy version. Brown's portrayal is truer to Verne's Land, but was undercut by the inclusion of an African-American character Cabe Attucks, which was sheer racial tokenism, as the character, intended to replace Conseil, actually ended up mirroring Ned Land as a second man-of-action in the storyline. To be cliche, there ain't room aboard this ship for two men like that. Ned Land acts as the physical foil to the mental prowess of Nemo, and adding another such character turns the tale into a cheap adventure story, which contrary to popular perception, it is not. I will add here that I love reading Ned Land as a French-Canadian, since lines like "Open up there, you antisocial navigators!" sound way funnier when you give them a stereotypical French-Canadian accent. In the above image, you'll see the original art of Ned Land, as well as the wonderful cartoony line drawing by French artist Brüno in his magnificent Nemo, available both as a four-part series in colour, or as a single volume in black-and-white. While Brüno does make some significant digressions from Verne, he seems to be playing off the tradition of 20KL in both print and film, rather than seeking to adapt the original work. His Ned Land is my favorite rendering, a symbol of physical might defined with spartan line art. Below, observe the stylistic differences in approach between Brüno's modern automatic weapon on the deck of the Abraham-Lincoln-as-battleship, and Gianni's historically accurate cannon-fire. The Abraham Lincoln's chase ends with its crippling by the monster. Here again I must stress that many modern readers are unfamiliar with 20KL, and that covers that show the Nautilus, or children's versions which render the image of it early on as clearly man-made ruin the surprise Verne has worked so hard to deliver to his readers (ostensibly, so have I in this post, but I'm not putting out a new edition of 20KL. One has to anticipate spoilers in commentary). I think the assumption readers will know its a submarine is a false one, a theory my reading of Arthur Slade's The Dark Deeps: The Hunchback Assignments Volume 2 seems to corroborate. Slade's pastiche of elements from 20KL does not assume readers are familiar with Verne's text. Instead, he almost seems to be seeking to write a new version of 20KL for modern readers, and approaches it with the same slow reveal process that Verne does, while simultaneously adding new twists for old Verne fans like myself. I will digress for a moment to highlight Conseil, who is both comedy relief as well as deliverer of scientific exposition, and foil to both Aronnax and Ned Land. He is like some sort of middle-child, even though he is younger than both the other men, seeking always to be agreeable. The reader sees clearly what kind of man Conseil is when Aronnax is thrown into the sea, a moment that has never been capture well in film versions: Peter Lorre's Conseil panics often, and seems conflicted about the decision to go into the drink after his master, while in both 1997 versions, he has been replaced: in one, by Aronnax's daughter (the better to have a love-triangle between Ned Land and Nemo, my dear), in the other, by the aforementioned freed slave Cabe Attucks. When I have asked students to "cast" 20KL, they are challenged most by Conseil, which strikes me as a commentary on how often we see a loyal, faithful servant and friend portrayed in modern film (students almost always resort to Sean Astin as Sam in Peter Jackson's LOTR). 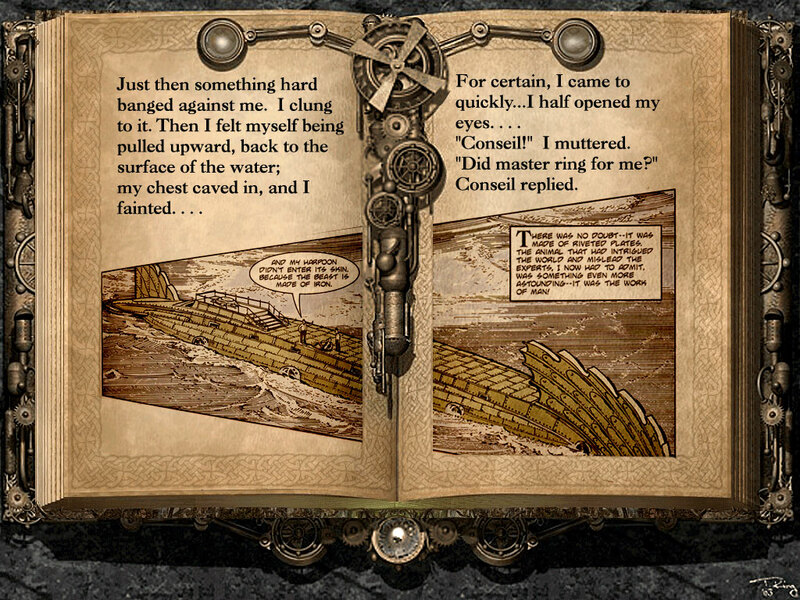 Conseil's unhesitating leap into the Pacific to help his master stay afloat is a defining moment for his character, especially when he replies to Aronnax's panicked calls with "Did master ring for me?" as though he were in the parlour, instead of swimming in the middle of the ocean, likely to drown. Huge props to Adam's Wallpapers, home of the animated steampunk book I used for these slides. I have no idea if Adam made it, but if he did, it's pure awesome. Hmm, hadn't considered reading 2kl yet, I'm about 1/2 way through Robur the Conquerer, a switch might be in order. 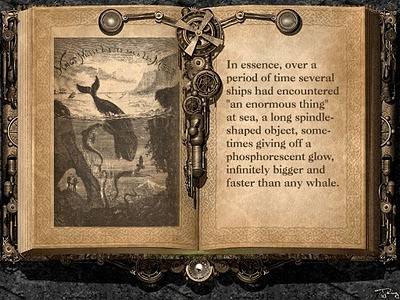 Among other things I think a major reason that 2kl is one of the most cited Verne books is that only a handful (4-5?) of Verne's nearly 3 score books are commonly known. Also something I find interesting is the extensive use of man-servants in Verne's books, although not all are stalwart companions. I find your suggestion, that the serial nature of his books publication might make them well suited to TV, an interesting one. I am finding that to be true with Robur. Finally, I know that Verne wasn't above sequels, but were his stories self-contained, or did he have any notion of a single continuity/universe? He references characters and events from 2KL in The Mysterious Island and An Antarctic Mystery, and then plays with a number of his characters and storylines in Journey through the Impossible, one of his stage plays. Not sure how consistent Vernotopia is beyond that. Cory Gross might know more on this. First, love your blog, when I get a chance to read it. Especially like this post simply because I've *actually read the book*, so I know what you're talking about. That's not always the case unfortunately. Warren, thanks for the kind words about the blog. I'm glad a number of you took me at my word about that annotated edition. As to your question, "Is it steampunk?" I'd answer emphatically, "Definitely not!" That's why I titled this month's theme "proto-steampunk." It's a precedent for steampunk. As to modes of impulsion in steampunk, if we limited it only to works where the fuel was steam, there wouldn't be very much to look at. I've said it elsewhere, but in the irony of steampunk is that steam is the least used fuel source, falling far behind fictional fuels such as aether, phlogiston, cavorite, or hydrium. I'm currently reading Cherie Priest's Dreadnought, and am impressed by how strong the sense of verisimilitude is because she sticks to coal and diesel fuels so much. I don't think it must be powered by steam to be steampunk. Then we end up with ridiculous sub-sub-genres. It's about the evocation of a cultural time period, not a technological method of impulsion.